Using our website, you're able to search for curtain fabric online and from the comfort of your own home. 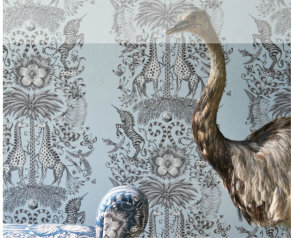 We feature a large range of fabric by the metre, made to measure curtains, wallpaper, furniture and tracks/poles. We manufacture all our own curtains and blinds to the highest quality here in our workrooms! When you shop for curtain material online, you want to be sure you're getting the best. We have over 40 years of experience in textiles and curtain making; our service and quality are always of the highest standard. Combining this knowledge with skills and enthusiasm, we can promise to custom make your curtains and roman blinds to perfection. You will not find better-made curtain fabrics online. We also manufacture high quality made-to-measure curtains and blinds. Ours are the best fabrics online and leading retailers, manufacturers and interior designers know not to shop anywhere else. Due to our custom made service, curtainsandfabricsonline have the ability to offer high quality bespoke curtains and blinds at competitive prices and within a fantastic 7 day delivery service! 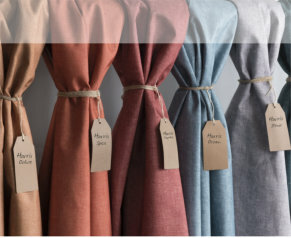 Shop our selection of online curtain fabrics and treat yourself to the best in the business. Our fabrics are carefully chosen from a range of suppliers with designs to suit every home, from contemporary to traditional. Our expertly made to measure Curtains are made on site here in the UK- all orders are dispatched within 7-10 working days from point of ordering. We use all high end products to complete your bespoke finished curtains. All our fabrics are sourced direct from the supplier, to enhance quality. Products are quality inspected throughout the make up process, so you really do receive value for money. 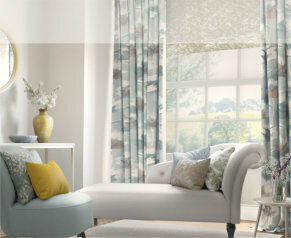 Roman blinds are a great alternative way to dress your window and create a modern and contemporary feel for any room. Our made to measure blinds are made to your specification so you can experience that perfect fit. Each blind is supplied with brackets that can be wall or ceiling fixed, enabling the blinds to be mounted in or outside your window recess, a sleek cassette head rail with chain pull completes the blind. All our blinds comply with British Safety standards and components are sourced from a reputable company, that test rigorously. All child safety components come with a 5 or 10 year guarantee. 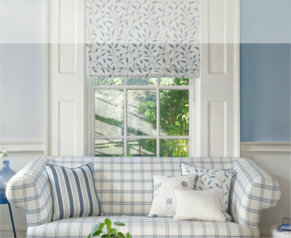 Curtainsandfabricsonline.com is home to thousands of designer wallpapers from Suppliers Such as Sanderson, Harlequin Romo PT and many more, our designs cover every need from classic to Contemporary; we have a wallpaper to suit every home.